An interview with a Palestinian-American feminist provoked a number of letters from readers. Editor’s Note: Collier Meyerson’s interview with Linda Sarsour about Zionism and feminism, published last week at TheNation.com, generated a number of thoughtful letters from readers, as well as a response from Emily Shire, whose New York Times op-ed on the subject prompted Meyerson’s interview. Selected letters, and Meyerson’s response, appear below; the first reply is Shire’s, a version of which she published at the Forward. I recently wrote in The New York Times about my concerns, as a Zionist feminist, with the March 8 International Women’s Strike. Because the platform for the strike called for the “decolonization of Palestine” as part of “the beating heart of this new feminist movement” and one of its prominent organizers, Rasmea Odeh, is a convicted terrorist, I feared there was no room for a feminist like myself who believes Israel has a right to exist. On March 13, The Nation published an interview by Collier Meyerson with Linda Sarsour, one of the leaders of the January 21 Women’s March. I respect the work Sarsour has done for the Women’s March, and I admire the way she has committed so much of her life to feminism. However, I was disappointed that Meyerson’s interview with Sarsour failed to address the actual concerns I presented in the Times. Meyerson and Sarsour glossed over the fact that I wrote at the outset, “I hope for a two-state solution and am critical of certain Israeli government policies.” Ignoring that basic tenet of my perspective is a serious misrepresentation that seems all too convenient. Sarsour then made an insinuation that was both presumptuous and inaccurate. She said, “It’s been a little surprising to the [right-wing Zionists] to see [Palestinian-American] women in leadership roles in social-justice movements because [they are realizing] it means that the Palestinian Liberation Movement and the Palestinian Solidarity Movement are gaining traction among young people and people of color in the United States.” Not only do I not identify as a “right-wing Zionist,” as noted above, but I certainly do not find the leadership of Palestinian women to be “surprising” or anything less than positive. I sincerely hope women of all backgrounds take on feminist leadership roles. However, I draw a hard line at convicted terrorists, like Rasmea Odeh. Odeh was convicted for her role in a bombing that killed two Jewish college students at Hebrew University in a trial deemed fair by an observer from the International Red Cross. Though she disputes her conviction, Odeh has never denied being a member of a US and European Union-designated terrorist group, the Popular Front for the Liberation of Palestine. Tellingly, Meyerson and Sarsour conveniently do not address Odeh’s history, even though it formed a substantial part of my piece—so much so that the Times chose to feature her picture on the page. Sarsour and Meyerson also failed to address why is it that Israel should be singled out for the suffering of Palestinian women and children. I deeply sympathize with Palestinian women; according to the United Nations, “29.9% of ever-married women in the West Bank and 51% in the Gaza Strip have been subjected to a form of violence within the household.” The same report noted that “According to the Independent Commission for Human Rights and women’s organizations, 28 women were killed in the name of so-called ‘honour’ in 2013, which signals a worrying deterioration and/or increased reporting, since in 2012, the reported number was 12 and in 2011, it was 8.” One would think that the organizers behind the International Women’s Strike platform would, at least, be just as interested in combating domestic patriarchal abuse and oppression of Palestinian women, who are also denied access to safe abortion—unless they travel to Israel. This insistence on impugning Israel alone in the oppression of Palestinian women, then, is neither fair nor factual. I am not suggesting anyone let the Jewish state off the hook or refrain from criticizing its government or policies. I am questioning why no non-Jewish state appears to have been held to the same standard. That does not seem to reflect a commitment to equality; quite the reverse. Sarsour said in the interview, “I would say that anyone who wants to call themselves an activist cannot be selective.” Thus, in addition to not acknowledging my argument, Sarsour does not seem to appreciate the implications of her own. My parents came to Israel from Morocco, a country where Jews and Muslims lived together in harmony for centuries. They instilled in me and my siblings a loving humanism that demands we treat people of different race, gender, and religion with equal respect. As an Israeli woman, I inhabit multiple identities—a Jew of Sephardi origin, a woman fighting for justice, a proud Zionist. Sarsour questions whether one can simultaneously be a Zionist and a feminist. The history of the feminist movement, and the rich tradition of feminism within Israel, argues unambiguously “yes.” To claim that these movements are incompatible effectively erases the legacy of Jewish women’s involvement in feminism—of women who simultaneously hold dear a belief in the right of the Jewish people to self-determination, and the reality of women and our allies who are fighting on behalf of women’s rights in Israel and elsewhere. Feminism as a global movement is about liberation of women from all walks of life and claiming agency over one’s own life for equity of opportunity. This movement must be open to women of all identities if we are to stand together for our collective liberation. As an Israeli committed to fostering a more equal and tolerant society—one in which Arab, Druze, Bedouin, LGBT, secular and religious, and Jewish and Palestinian women have an equal place—I am proud to say that I am both a Zionist and a feminist. As a young Jewish woman who loves Judaism and whose Jewish journey is inseparable from my activism, I write to share my dismay—not with the content of your article but with the title your publication chose for it. The title is clickbait and is not reflected in Linda Sarsour’s thoughtful interview. This is what she says: “‘Is there room for people who support the state of Israel and do not criticize it in the movement?’ There can’t be in feminism. 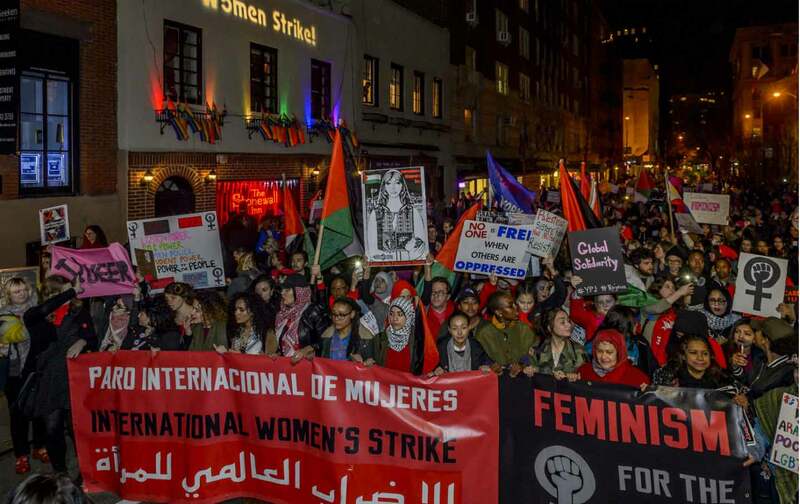 You either stand up for the rights of all women, including Palestinians, or none.” This says nothing of excluding Zionists from the feminist movement, and your title’s suggestion that it does caters to a dangerous conflation of Zionism and a refusal to criticize Israel. Headlines like this create misperceptions that hurt our movements for justice. Erasing the nuance of Sarsour’s comment diminishes a powerful opportunity for people involved in the feminist movement to learn about the struggles of Palestinian women, and to realize the ways in which this struggle can/should become an integral part of their Judaism (and their Zionism). If I have learned one thing so far as a young person doing this work, it is that my desire to criticize and push Jewish and Israeli institutions comes from a place of deep love. I criticize Israel because I am a Zionist, and because I long for it to be a place that lives up to the Jewish values I hold. I push my Jewish community to fight for justice, because I cannot imagine my life without it and want it to be the vibrant, dynamic community I know it can be. In order for this to be possible, we need to lean into the nuance, holding the criticism and love together in our fights for justice. In this time of alternative facts purging reality, I was disappointed to see Collier Meyerson’s interview of Linda Sarsour. To lump into the struggle to protect and advance women’s rights the dispute as to whether Israel has a historic right to exist or is a colonial power controlling the West bank like China controls Tibet is wrong. By drawing the Israeli/Palestinian conflict in as a “feminist” issue, Sarsour and others push away allies who support improving the lives and positions of women in this country and in every other country in the world, but believe Israel has a right to exist. Colonialism vs. poor people of native origin is an interesting topic for one discussion, but it is totally different from whether women should be empowered to have an education, own their own property, work outside the home, have a salary equal to that of men, etc. Here, in the United States, we have already moved away from guardians controlling who we should marry as well as our property, or laws allowing the beating of wives under some circumstances, all legal in the 19th century. Our issues for the last 30 years have been focused on the rights to be educated, be able to work in fields and professions for which we can be qualified by training and education, salary equal to that given to a man with the same responsibilities and education, protection against domestic and other physical or mental abuses, access to good, safe, affordable childcare as well as the opportunity to stay home with our children or not to have children if we so choose. There has been great progress, but also strong push back to each and every gain. We who the treasure the life of each woman as much as we support women’s potential to bear new life currently face some rather pressing issues. Health insurance for all of us, men and women, may be even more difficult to obtain and expensive in the near future. At the same time, a decrease in environmental, product- and food-safety regulations might trigger more asthma, food-borne illnesses and other problems we thought we were eradicating. There is quite a bit to do just within the territory between the Atlantic and the Pacific Oceans. Israelis also want to live in peace and security and also believe they have an historic right to live on the land now called Israel. The right to live in dignity, peace, and security belongs to women in Israel, in the West Bank, in Syria, in Europe, in the United States, in Russia, all over. And, it also belongs to men. It is not strictly a women’s issue. We in the US do have plenty of our own rights that are being eroded as I type. And if we don’t work hard and focus on protecting them, they will be gone. Then, there are real problems elsewhere, like rapes where the one raped is dishonored and sometimes killed to protect the honor of her family, and other issues applying only to women. Pulling the “Palestinians are subject to colonial rule” versus “Jews have historically and religiously been attached to the land for centuries and, by the way, Israel is a democratic state” issue into the definition of “feminism” dilutes the real issue and pushes away potential allies, like me. This is wrong, especially since when everything folks have fought for and won since the turn of the 20th century is under attack. Shire’s New York Times op-ed posed a complicated question: “Why should criticism of Israel be key to feminism in 2017?” Criticisms of Zionism and feminism, Shire argued, should not exist in the same spaces. The piece struck me an argument against intersectional feminism, a well-established movement within feminist thought since the 1980s that posits that race, gender, sexuality, ethnicity, and class shape one another and should be tackled together. As I mulled Shire’s op-ed, I wondered what voices were being left out of this debate. The answer seemed obvious: Palestinians. This happens far too often in high-profile discussions of the Israeli-Palestinian conflict in American media. So when I set out to respond to her piece, it was important to me that I elevate someone who held an opposing view. Being a Palestinian-American, a feminist, an activist and an organizer, Linda Sarsour was ideally situated to address Shire’s op-ed. In addition to being the executive director of the Arab American Association of New York, Sarsour was an organizer of the Women’s March on Washington, perhaps the largest political protest in American history. Shire did not get the answers she wanted from Sarsour and sent a letter to the editor, which she also published as a rejoinder to the Q&A in the Forward, indicating that she wanted a point-by-point rebuttal of the New York Times op-ed. But a point-by-point rebuttal was never my intention; rather, instead, I wanted to explore the other side of this debate with a person qualified to address it. Shire’s demand that either Sarsour or I address her bill of particulars was particularly perplexing to me since Shire herself did not take on, in either of her pieces, a single opposing viewpoint. Shire’s op-ed left out a lot of relevant information. And it’s possible that she did not have space in her piece to dive into all the nitty-gritty details of all the points she raised. But here are some details the discussion is incomplete without. Shire dismissed Rasmea Odeh as a “convicted terrorist” and, while acknowledging that her conviction is disputed, declined to mention that Odeh has alleged she falsely confessed to helping orchestrate an explosion that killed two Israeli civilians only after she was tortured and raped in Israeli custody for 25 days, at age 21. This is a relevant detail not only in the dispute over Odeh’s conviction but also to the larger debate over whether criticizing Israel should be key to feminism in 2017. At play here is a woman who says her breasts and genitalia underwent electric shock, and that her torturers raped her with a thick wooden stick. Shire had a chance to make her case, and she did it in the esteemed New York Times op-ed pages. But the question she asked—“Why should criticism of Israel be key to feminism in 2017?”—leaves room for many answers other than her own, and I simply tried to provide one. Shire doesn’t get to dictate the terms of the debate to an intersectional Palestinian feminist. That’s the viewpoint I sought out for my Q&A, and I hope readers of The Nation found it enlightening and engaging.